Did you know that 89% of consumers begin their buying process with an online search? Here’s the thing. Your website is the hub of your digital marketing efforts. So if your appearance in the search engines and your website fail to connect with and engage prospective customers, then you need to take action. But that’s not all. Every digital marketing activity you carry out from search engine optimisation through to content marketing, social media and email drives audiences to your website. So you need to know if your site is supporting your marketing goals. What does a website content audit cover? First off, it assesses how clearly you outline your promise. By this, I mean how your product/service solves your audience’s problems and the benefits you offer. Next, it looks at how persuasive your messaging is. Is your copy customer-focused? How accurate and up to date is it? Does is answer your audience’s questions in a language it understands? Then is assesses how content guides readers through their decision making and drives action. And if you provide proof and credibility to support your claims. After that, it looks at how your content flows. How logically you place your content. How easy it is to navigate your site. And how hard your visitor needs to work to find the information it needs. Beyond that, a content audit looks at your tone of voice, consistency of messaging and formatting. The aim is to find out how easy your content is to read and digest. Most importantly, a content audit assesses how well your copy ticks search engine optimisation (SEO) boxes. First off, your website content audit will identify content strengths and weaknesses. After that, it will identify gaps and give you recommendations and a roadmap for making strategic changes that’ll improve the performance of your website. An independent auditor looks at your website with fresh eyes. Not only that, a third party has an objective and impartial approach. How often do you need to audit? To get consistent results from online marketing, audit your content regularly. With this in mind don’t use an audit to troubleshoot problems when they arise. What makes a successful website content audit? Your website is the hub of your online and offline marketing activities. It communicates what problems you can solve for your audience and how you differ from your competition. So useful, relevant and persuasive sales focused web copy is fundamental to its success. With 89% of consumers beginning their buying process with a search online, can you afford not to assess your content’s effectiveness at attracting visitors in the search engines and guiding action? The good news is it doesn’t have to be you who carries out a content audit. 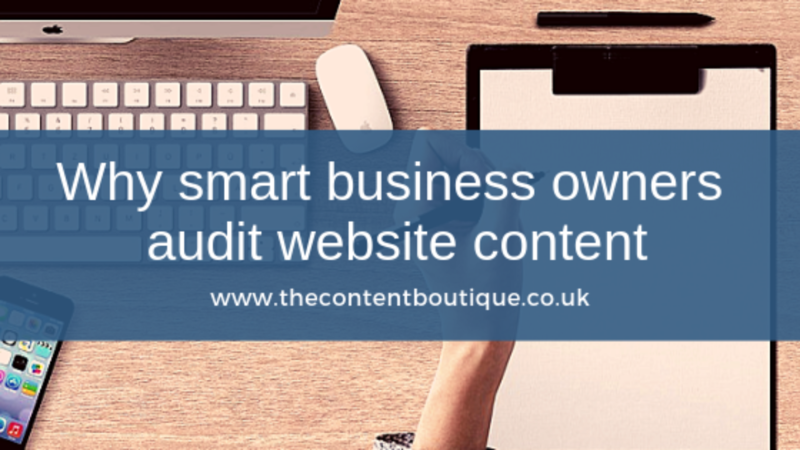 If you would like help getting the groundwork you need to produce smarter content that drives more traffic and generates more leads, then get in touch about pricing for a content audit. Trust me, it’ll be worth it.